Plumen has redesigned its 001 bulb with a patented LED construction to replace the previous compact fluorescent technology. Despite changing the technology, the brand has retained the bulb's recognisable double-looped form, designed with British designer Samuel Wilkinson. 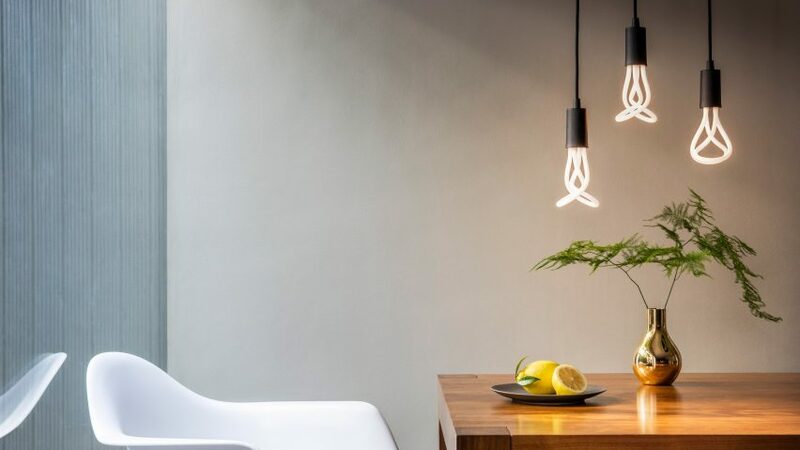 "Our goal is for sustainable design to be a natural choice and our light bulbs aim to inspire that change," said Plumen co-founder Nicolas Roope. "Our original 001 is a tough act to follow, but we believe this reincarnated 001 LED will become a new classic, and a sound choice for anyone who enjoys beautiful design that doesn't cost the earth," he added. This is not the first time Plumen has updated one of its bulbs to LED. The company released a set of LED Edison light bulbs back in October 2016. However this is the first time that the Design of the Year-winning 001 bulb has been revised. The bulb is now completely dimmable and has a lifespan of over 20,000 hours, which is equivalent to almost twenty years of average use. "LED technology has been developing rapidly. But it has taken a while for the flexible LED filaments to mature and stabilise enough for us to use it as an alternative to the compact fluorescent technology, previously used by our classic 001 bulb," Roope told Dezeen. "Two years ago we could see the length, performance and quality of the flexible filament were going in the right direction which meant we could start engineering and pre-production. Now we finally have the production model out in the market," he continued. According to Roope, LED technology is superior in nearly every way to compact fluorescent. It allows dimmability but also grants even greater efficiency, better quality of light and a much longer lifetime. Using LED technology also enables Plumen to make the bulb 100 per cent recyclable – which Roope sees as another small step in the right direction. "We started Plumen because the climate change discussion seemed to centre on this idea that a more sustainable world demanded painful sacrifices that most weren't prepared to make," he told Dezeen. "Plumen took on the humble efficient light bulb, partly because lighting is one of the largest energy use categories, but also because of its potency as a symbol for ideas and innovation." "We believed that if you could prove that a low energy product could be cool and coveted, you'd break the spell of this perceive incompatibility between pleasure and sustainability," he continued. "This approach could be applied across all sectors, and designers can seek to scale these positive switches and really unlock huge momentum to drive mainstream adoption and positive change." The new LED bulb is available in three colour temperatures – super-warm, warm and cool. In the future, the brand are looking to provide smart control to make their products even more efficient, combining Plumen bulbs with sensors and controllers to make sure that they're only on when they need to be. In addition to making its 001 and Edison bulbs LED, Plumen also released a new LED light in September 2016 with a gold-coloured shade inside the bulb that "makes you look more beautiful". Photography is by Charles Emerson. Styling is by Emma Kay.